I’ve talked before about creating beautiful combinations using primarily foliage as a starting point and adding flowers to complement leaves. 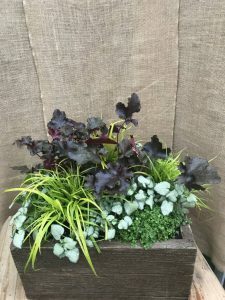 While this post is about choosing interesting plants for containers, the design concepts are used by the best garden designers for beautiful landscapes too. Plantings in pots are much less intimidating, though, and are a way to try new things just for fun. 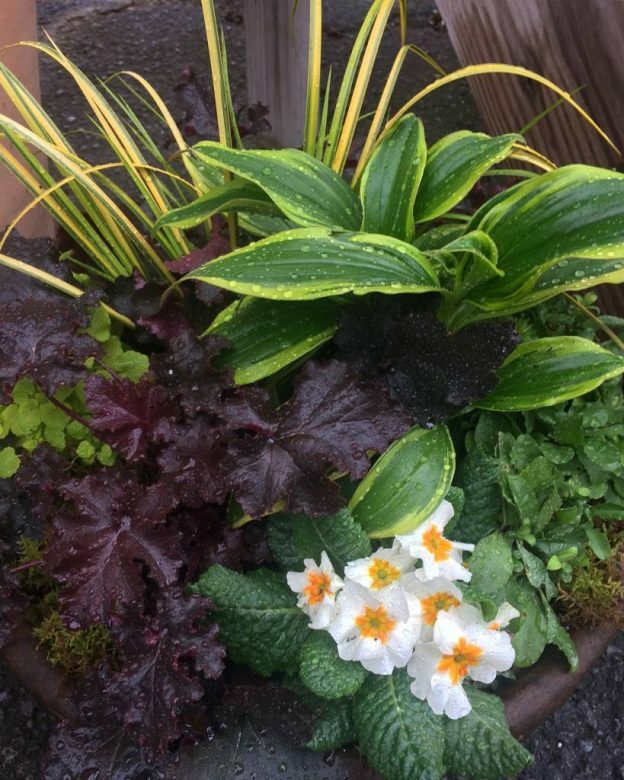 Use your container as a starting point to give you hints about what will look best. Does it contribute color or texture, or is it fairly plain? 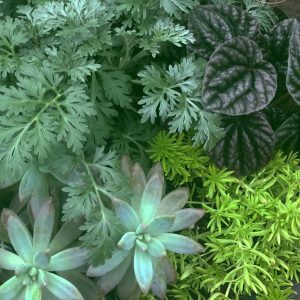 The point here is that leaves in plantings add color too and sometimes last longer in a design than flowers; so think about this as you study the look and shape of your pot. 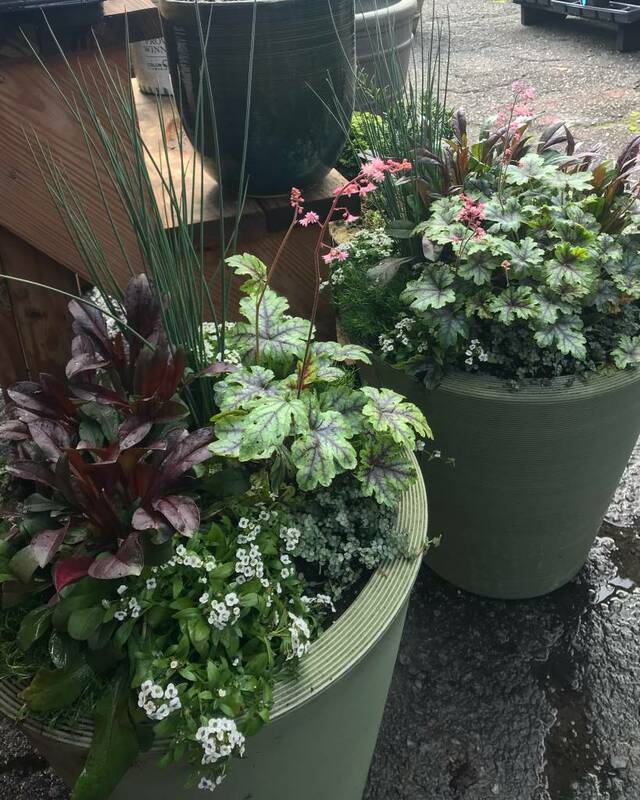 Are you looking for a container planting to be a focal point in a particular area? 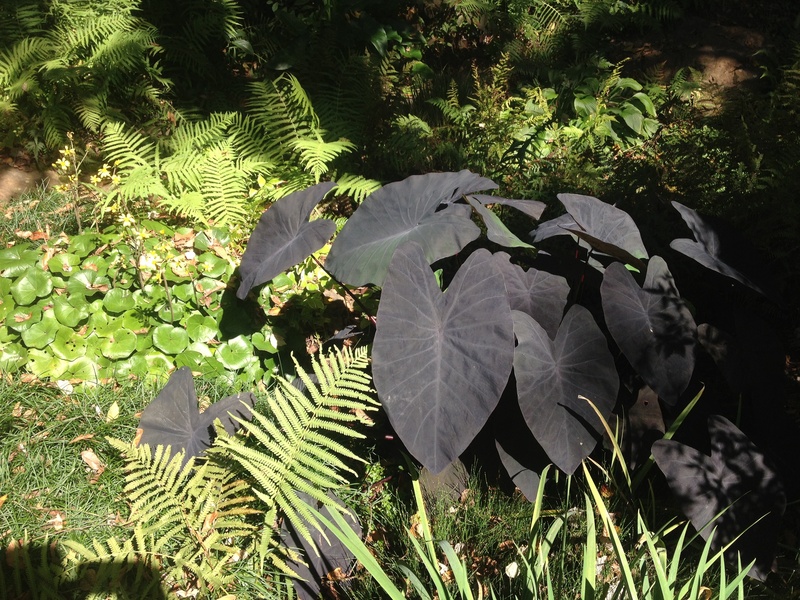 Some of the most dramatic plantings I’ve seen have made use of extremely large foliage plants, elephant ears being a notable example. 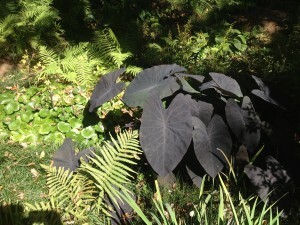 The photo here showing black elephant ears, fern, and ligularia in my garden is an example of a landscape design that would work in a contained planting too. The addition of the chartreuse color of a creeping jenny to trail would add additional impact. 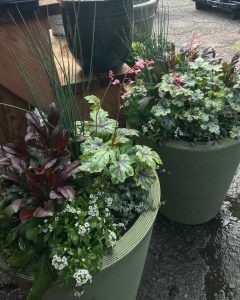 Conversely, smaller pots work well to showcase one striking specimen plant, and groupings of pots with one variety in each can be very beautiful. Take a walk through a favorite greenhouse or nursery, looking for leaves that catch your eye (If the plants bloom too, consider it a bonus.) 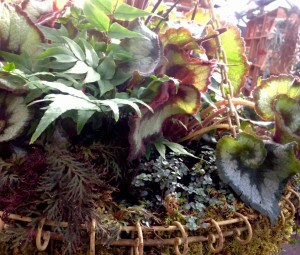 or start with some foliage plants you like and add blooming plants to accent them. Be sure to match the choices with the amount of available light, whether it’s full or part sun or shade. 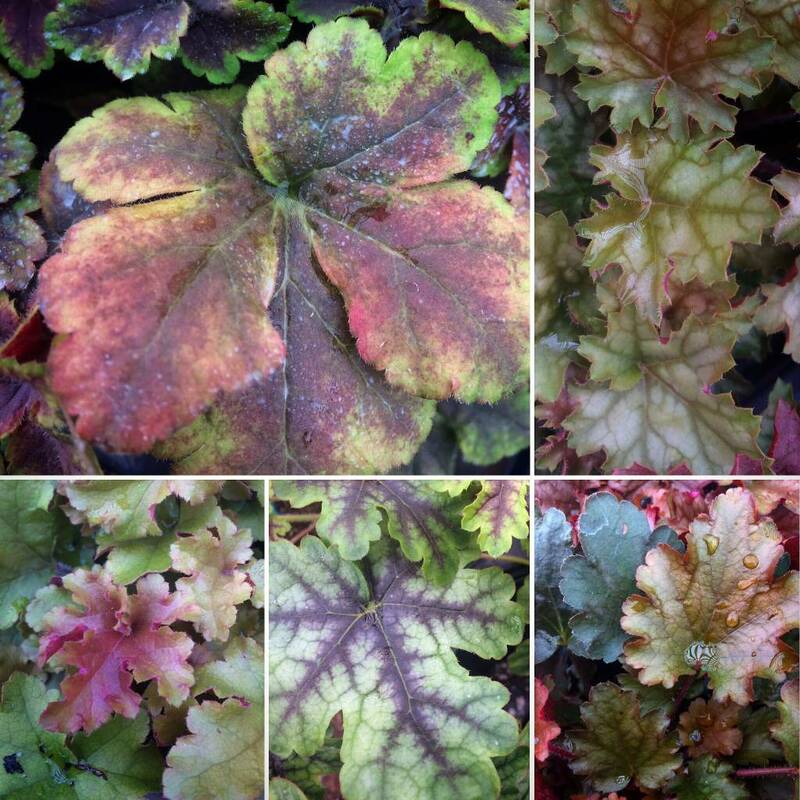 The first collage shown here is a small sampling of heuchera leaves, a perennial that shows off its leaf color in the late winter and early spring. 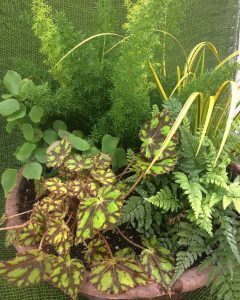 Houseplants are also very useful in plantings for shade and love the humidity our summer days and nights provide. 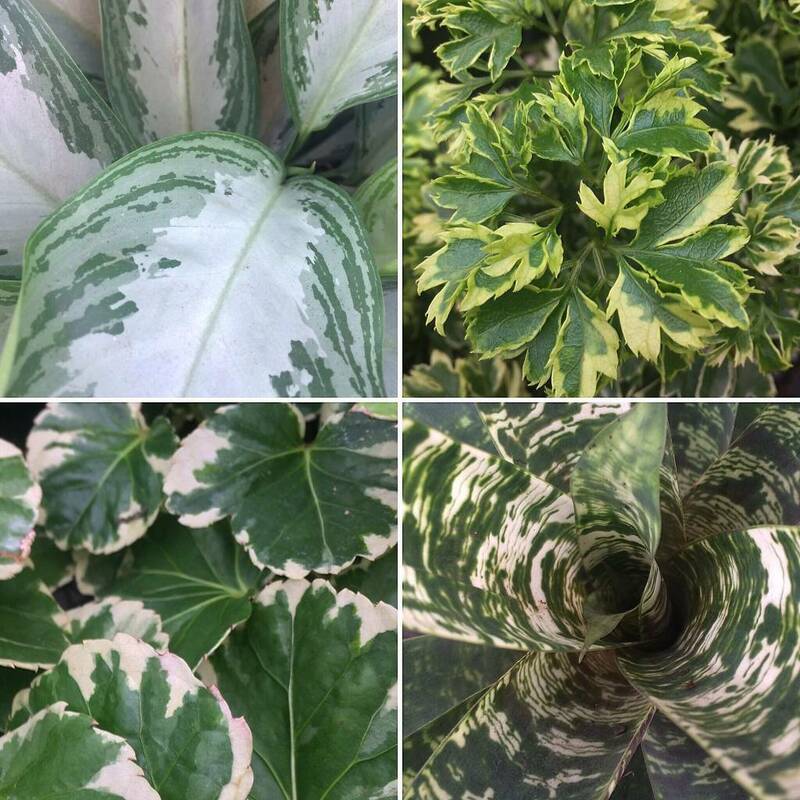 The second collage shows a few common but very beautiful houseplants. 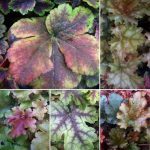 Showcasing a grouping of a few favorite and well grown rex begonias could also be a stunning tableau on any shady patio or porch. The bottom line: Try to choose plants that play off your container’s size, color, and shape. 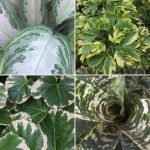 When choosing your plants, consider your light and find those plants that have contrasting foliage shape, texture, varied sized leaves and that need the same water requirements. Don’t be afraid to experiment with a new plant you’ve never tried before, and ask for help if you have questions. Enjoy your new plantings, and show them off to your friends! 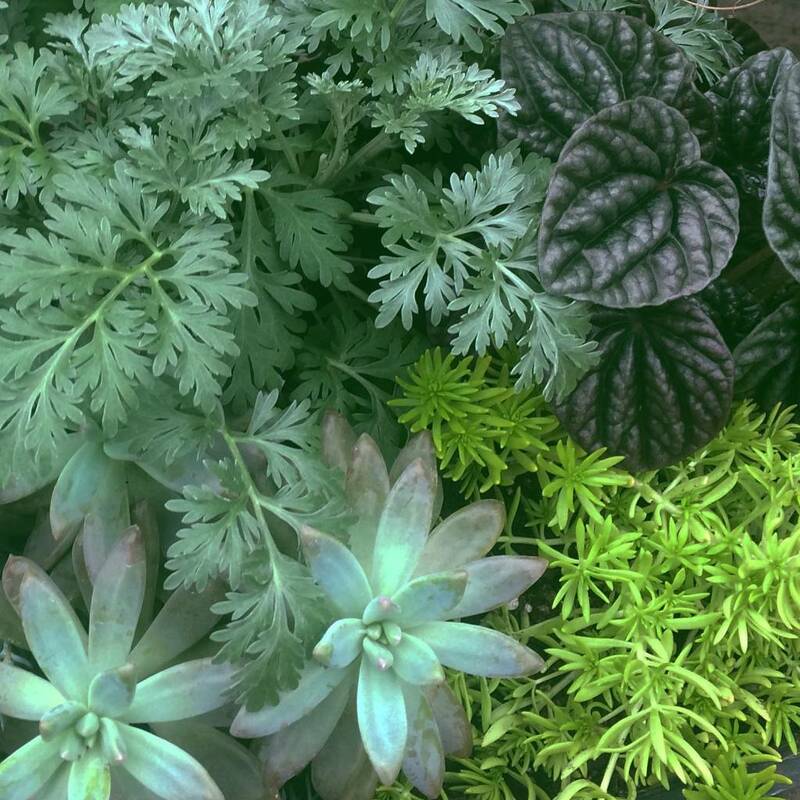 Now that you’ve taken the time to choose just the right plants, take care of them. Start by purchasing a quality, light-weight soilless potting soil (We carry Fafard, and use it for all of our plantings.). Add a slow release fertilizer such as Osmocote. Position the plants in the container, then remove the plants from their pots and set them on the soil. Do any have roots completely encircling the rootball? Loosen them gently before planting. Firm each plant into the pot, and water them well. As your plantings grow, they will need occasional trimming and grooming. This is part of gardening, and should be looked on as a normal part of plant ownership. Don’t be afraid to clip a plant back that is overgrown and remove any yellow or discolored leaves. If you’ve added blooming plants to your combinations, be sure to deadhead, or remove old blooms, regularly. This entry was posted in Container, Container Gardening, Planting Tips and tagged container maintenance, designing container plantings, foliage in containers on March 17, 2018 by Kris Blevons.